FITMENT: Any Year Vehicle with power door locks. For the Ultimate KEYLESS experience The iKey is our most advanced RFID Keyless system yet, fully replicating the complete keyless operation found on today’s most advanced luxury vehicles. 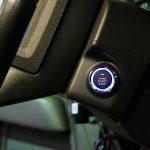 iKey combines “Hands Free” Keyless Access, Keyless Security and Keyless Ignition all into one system. 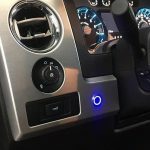 Now you can “Go Keyless” with any vehicle you own! The iKey uses advanced RFID (Radio Frequency Identification) technology from Texas Instruments®, to provide you the ultimate in convenience and protection for your vehicle. No more frustration from searching or fumbling around with keys or remotes. You simply place one of the systems RFID key fobs in your wallet, pocket or purse. As you approach your vehicle, your RFID key fob is detected and your vehicles doors instantly unlock. Just climb in, and with a push of the Start Button your engine roars to life. When you exit your vehicle, you just walk away. . . . As you leave the systems frequency range, your doors will automatically lock and iKey’s advanced two stage security system will self-arm leaving your vehicle securely protected. It’s Impossible to forget to protect your vehicle! *** iKey is also available with optional Remote Engine Start to warm your car in the winter or cool it down in the summer. Losing Your Keys Never Felt So Good! The iKey system consists of two independent control modules: A hands free PKE module (Passive Keyless Entry module) and a PBS module (Push Button Start module). The PKE module is responsible for “User Authentication” as well as handling all communication with the systems RFID Key fob. It also instructs your vehicles door lock system and other related security systems and components when to operate. The PBS module is responsible for electronically replicating all functions of your old ignition switch. It allows you to start your vehicle or choose to just turn on the accessories like your radio all by the push of a single button. All electronic switching is done by independent high current relays which are housed inside the PBS module. The modules communicate over a single data wire running between them creating a True Keyless experience. The importance of using two separate modules is that it assures the heat and interference caused by high current switching of ignition circuits is kept completely away from the more delicate communication electronics. The iKey™ uses the latest advances in RFID technology to deliver a level of security even better than many OEM keyless systems. The iKey™ operates using our exclusive DFDE (Dual Frequency ~ Dual Encryption) communication technology. Each iKey™ is completely unique, one of over 6 billion different codes. Never again search or fumble with keys or remotes with totally “Hands Free” operation! The slim and sleek, iKey™ is only 2.5″ x 2″ x 1/4″. Small enough to fit in your wallet, but powerful enough to deliver the ultimate in vehicle security and convenience! A single iKey™ can be programmed to multiple vehicles. So one iKey can operate every vehicle you own. The iKey are now available in two styles, Our popular Slim line style fob and are new OEM style fob. Both fobs provide the full range of iKey features and operations. *** See the “Key Fob Styles” Tab on this page for additional information. iKey will give you visual confirmation that it has armed or disarmed by flashing of your parking lights when you approach and exit. If you accidentally leave a door OPEN when you leave your vehicle, iKey™ will alert you with three quick flashes and siren chirps as you walk away from your vehicle. The iKey™ will effectively operate on everything from a small sub-compact to full size SUV, the systems dual antenna design guarantees consistent range and performance regardless of vehicle type. The three buttons on the key fob allow you to unlock / lock doors or remotely pop your trunk from an extended distance. They also provide Car finder an Panic Alert functions. 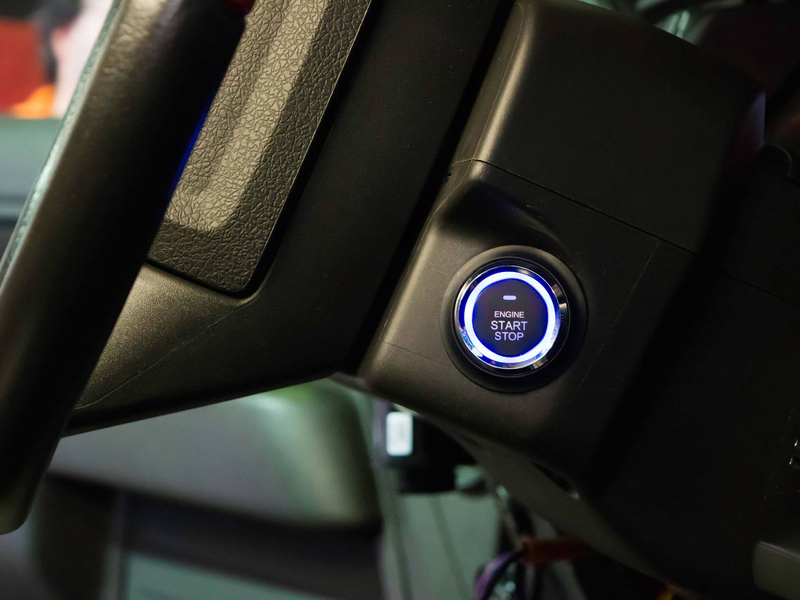 With iKey™ custom feature select, you can have the system automatically lock your doors after turning ON the ignition and automatically unlock when the ignition is turned OFF. A high output Blue/Red LED warns would-be thieves your vehicle is protected and keeps you informed of system status. Should you ever lose or damage your Key fob, the system includes an Emergency Backup Transponder Card to always guarantee you access to your vehicle. This is the same “passive transponder” technology used for access of high security buildings. Just hold the Bypass Card next to your windshield for 6 seconds and doors will unlock and you will be able to start your engine. Emergency Bypass Cards are completely waterproof and use no batteries making them perfect as a backup access device. Another Exclusive iKey Feature! iKey™ systems come standard with our 22mm Billet style Start Button, It is a top quality / heavy duty cycle switch with an attractive “soft brushed” finish. An Illuminated halo LED ring indicates system status. Switches are pre-wired to a 36″ plug in harness. Available in 3 LED colors; RED, BLUE or GREEN. The iKey is fully integrated with all high current relays are right on board, providing individually controlled switching for Starter, Ignition and two separate Accessory circuits. One ACC circuit switches OFF during starter crank (to minimize current draw from components like A/C) and another that stays ON (for components such as computers). We’ve taken one of the most popular accessory of the decade and built it right into our top of the line iKey™ system. Now with just a press on your iKey fob you can remotely start your engine to warm your vehicle on the winter or cool it down in the summer. 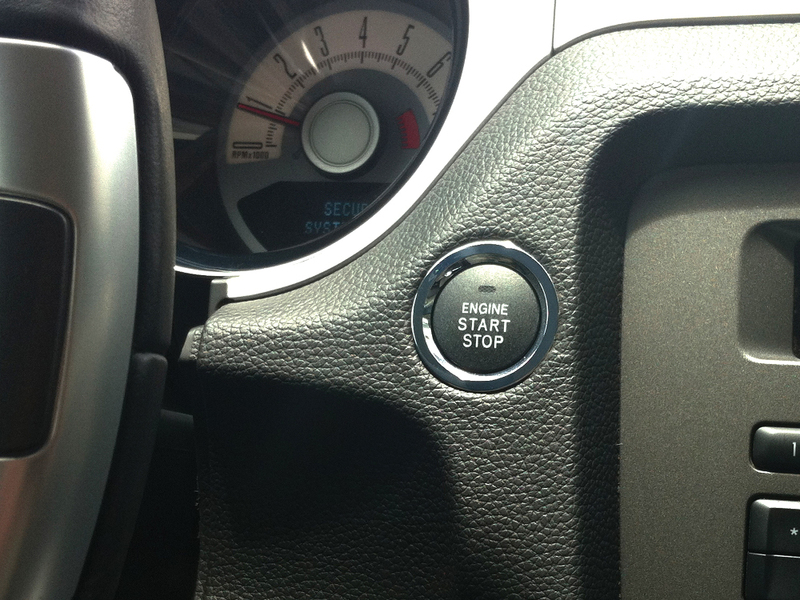 Customize your ultimate Keyless installation with one of our many optional Start Buttons. We start with of the most beautiful OEM buttons available and individually modify them to work with the iKey™ It’s the perfect finishing touch! The iKey system also provides all the functions of a full feature alarm that automatically arms and disarms when you approach and exit your vehicle, including a dual stage shock sensor, “warn away” intrusion monitoring and outputs for horn or siren. If your vehicle already has some level of OEM Factory security system installed, iKey™ will control all Arming and Disarming of your factory system automatically! Whether you have a factory “Chip in the Key” system, or the latest CANbus digital electronics. Our advance design include outputs to control external data or bypass modules allowing iKey™ to be fully compatible with virtually all electrical systems from classic cars to the newest computerized electrical systems of 2018 vehicles. Slim line Style iKEY Fob Our Slim line fob turned a lot of heads in the keyless world when we introduced its sleek new design to automotive industry. Our innovative engineering resulted in the worlds thinnest active RFID transponder ever made. 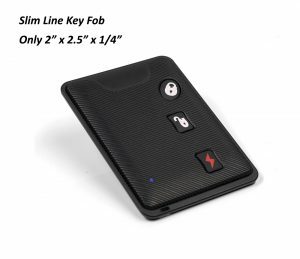 At only 2.5″ x 2″ x 1/4″ in size, it will easily can slip into a wallet, pocket or purse without the bulky size or extra weight of a traditional vehicle remote. Its sleek and stylish appearance reflects the technical sophistication that went into this advanced design. This Slim line iKey™ will perform complete “hands-free” operation of your doors and ignition without ever leaving your wallet. 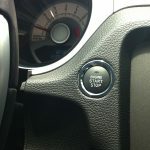 Three recessed buttons provide functions for extended range lock, unlock, trunk open, panic and optional remote start. A distinctive blue LED confirms your commands are sent and received by the iKEY system. You’ll love the distinctive look and feel of this slim little high tech wonder. OEM Style iKEY Fob In our never ending quest for perfection, our engineers set out to create a new OEM style key fob to rival that of the worlds top luxury automakers. With an exquisite new design that is both stylish and functional, the new iKEY OEM fob provides fully automated operation of your vehicle’s doors and ignition in a sleek, elegant new package. A quick glance is all that is needed to appreciate the fine craftsmanship that went into this advanced design. Its rugged high impact plastic housing is surrounded by a broad band of heavily plated chrome giving it an exquisite upscale appearance. The elegant chrome banding also features two eyelets for attaching your fob to an existing key ring if desired. The soft textured finish feels luxurious in your hand and makes gripping easy. The updated outer case is thicker, more substantial, and made to endure punishment. In addition to performing “hands-free” operation of your doors and ignition, the OEM fob features 3 buttons which provide extended range lock, unlock, trunk open, panic and optional remote start functions. A cool blue LED confirms that your commands are sent and received by the iKEY system. This innovative design also incorporates a hidden compartment inside the fob to insert a “Hide a Key” blade for your door locks, assuring you’ll never be locked out of your vehicle in the event of a dead car battery. You’ll feel like a VIP when you upgrade your iKEY system with the beauty and feel of the awesome new OEM key fob! Will this system work with custom vehicles? Many of our customers have Custom vehicles, the ikey system is a great fit for all vehicles with power door locks, If your vehicle is very heavily modified please give us a call to make sure the ikey system is the best fit for your needs. When do I have to replace the battery in my key fob? We recommend changing your batteries once a year, depending on use you can expect to get 1-3 years out of your key fob batteries. How Many fobs come with the system? The iKey comes with one fob, either our credit card style for or our OEM fob, you can select which you would prefer, to add additional fobs please select how many you would like from the drop down. What button will work best for me? Our most popular buttons are our Slim Line Lexus buttons that fit great in almost any vehicle, our Honda S2000 button, or our standard 22mm billet buttons. I have a Diesel will the ikey work for my vehicle? The iKey systems will work with diesel vehicles, there is only 1 additional wire connection required for diesel applications. I ordered a Button that was 19/22/25mm and the one I received was bigger. When we measure our billet start buttons we measure the barrel size of the button (the size of the hole you will need to drill). The face of the button will be roughly 3mm Larger than the barrel. Please see our Buttons selection page for specs on all buttons. What type of batteries do the fobs use? All of our fobs use a standard CR2032 battery, these can be found at any dealership, retail or hardware store. Can my key fob control numerous Vehicles? Yes, your key fobs can be programmed to as many push button start systems as you want, giving you the ability to only carry 1 key fob with you and hop into which ever vehicle you feel like driving that day. How often do I need to replace the battery in the key fob? We recommend replacing your key fob battery once a year. How do I know if my vehicle needs a data module or bypass module? The best way to find out whether you need a data module or a bypass module is to simply give us a call, if it’s an older vehicle you may not need either. How difficult is the installation? he installation is very straight forward and is very similar to a remote start install, we recommend professional installation of the ikey system. How would I start my car in the even that I lost my key fob or the battery died? Each system comes with an emergency bypass card, simply wave the card near the bypass antenna and the doors will unlock and you are able to hop in and start the vehicle. The emergency bypass card is completely waterproof and does not require batteries. Can the system use a different button rather than the ones you supply? 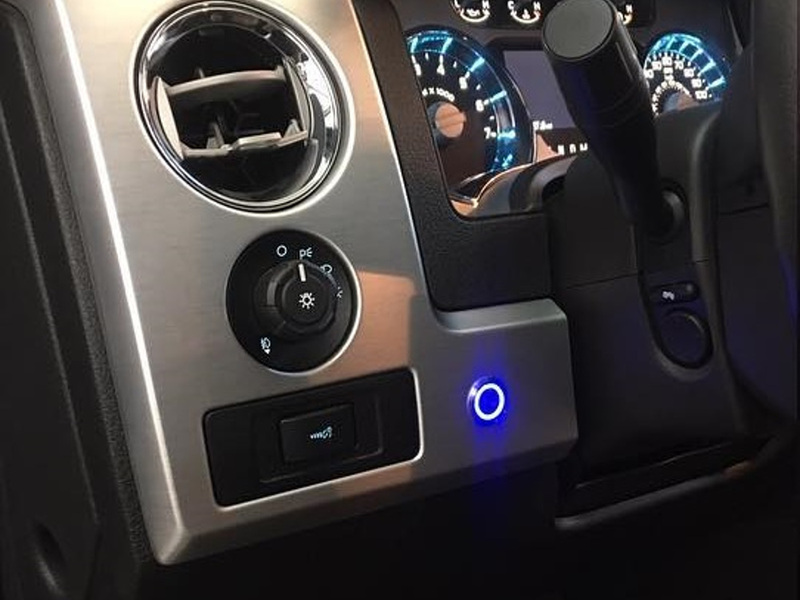 Yes, You can use any momentary 12V button, we can also modify buttons to work with our system, just give us a call at 877-246-5395 and we can assist you with making sure your vehicle has the look you are wanting it to have. If I change the battery in either the car or key fob do I have to reprogram the key fobs? No, The key fobs use non-volatile memory, meaning that they will never lose their programming if power to either the key fob itself or the module is lost.